Manchester United's players took the applause of Old Trafford - but it was acknowledgment of a plucky effort rather than praise for any serious quality. Solskjaer and his side are left hoping for the same sort of miracle that saw them overcome a 2-0 home defeat to come through the last 16 against PSG - but lightning does not usually strike twice, Barcelona are a superior side and the Red Devils have won only once in the Nou Camp, when they beat Bayern Munich there in the 1999 Champions League final. Manchester United manager Ole Gunnar Solskjaer: "There were pluses and negatives. We started sloppy and a bit nervous. After their goal we settled and played well. "We had very good individual performances in midfield. At times it felt like a proper United team - the crowd were behind us, we got out wide and got crosses in. "We didn't start great, but it was a great goal and movement from Messi and Suarez but they're fortunate it comes off Luke Shaw. It's a blow but we settled well. We're still in this tie." Barcelona manager Ernesto Valverde said: "It's a good feeling because it's a decent result. We know it's still tight and there is a second game to come. We know they can react away from home and they did well against PSG. It was a very tough game and what we expected. There were moments where we suffered but we are happy." Former United and current Barcelona defender Gerard Pique: "After seeing the PSG game, you do not have to trust the result - they came in Paris with a better result and look what happened. Big clubs can do these things, you have to work it out. "It was special to come here after so many years. We are defensively at the best moment of the season. I feel comfortable because of my age and experience." This was Barcelona's fourth Champions League victory against Manchester United, with each one coming in a different stadium (Nou Camp, Stadio Olimpico, Wembley and Old Trafford). 36% of Manchester United's total home defeats in the Champions League have been against Spanish opponents (5/14). Luke Shaw's own goal was the eighth Manchester United have scored in the Champions League - no side has conceded more in the history of the competition. Match ends, Manchester United 0, Barcelona 1. 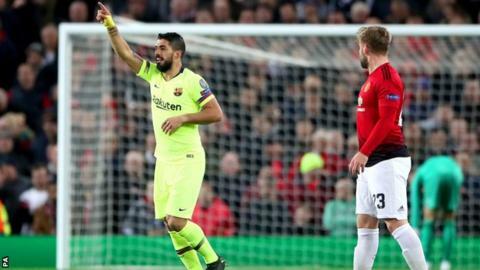 Second Half ends, Manchester United 0, Barcelona 1. Attempt missed. Chris Smalling (Manchester United) left footed shot from the right side of the box is too high following a set piece situation. Substitution, Barcelona. Carles Aleñá replaces Sergio Busquets. Substitution, Manchester United. Andreas Pereira replaces Marcus Rashford. Corner, Manchester United. Conceded by Gerard Piqué. Attempt saved. Lionel Messi (Barcelona) left footed shot from outside the box is saved in the centre of the goal. Nélson Semedo (Barcelona) wins a free kick in the attacking half. Substitution, Manchester United. Jesse Lingard replaces Diogo Dalot. Attempt missed. Marcus Rashford (Manchester United) right footed shot from outside the box is too high from a direct free kick. Substitution, Manchester United. Anthony Martial replaces Romelu Lukaku. Attempt saved. Jordi Alba (Barcelona) left footed shot from a difficult angle on the left is saved in the bottom left corner. Assisted by Luis Suárez. Substitution, Barcelona. Sergi Roberto replaces Arthur. Attempt missed. Luis Suárez (Barcelona) right footed shot from the right side of the box is close, but misses to the right. Assisted by Nélson Semedo with a through ball.